Hi friends! Did you hop along for the blog hop yesterday? If not, CLICK HERE to visit my post. Don't forget to leave comments on each stop of the hop for your chance to win one of 2 $25 Gift Certificates to Catherine's store. I have some more cards to share with you today using the goodies in the collection. Today some of the creative team are sharing with a video hop. You can check that out on Catherine's blog. 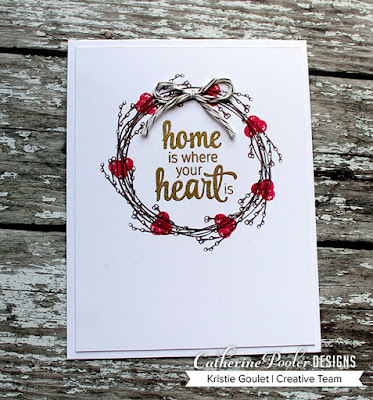 My first card features the gorgeous wreath in the Sweet Home Wreath stamp set. This stamp set is a 6x8" set. I love stamping leaves in gray's and adding a pop of color. That's exactly what I did here. I die cut it using the coordinating Add-on dies. 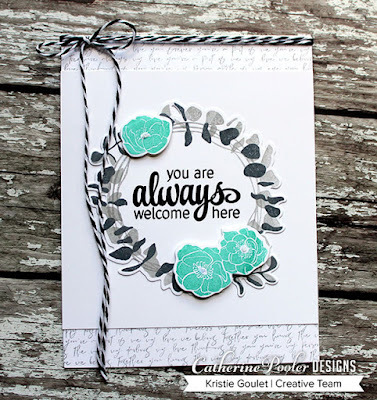 I stamped the Love Note background stamp on my card panel using Twilight ink to add a bit more to my card. I love the subtle words in the background. This card uses the same stamp set, just different elements in the set and a different sentiment. And my last card features The Key stamp set. I stamped one of the keys across my card panel using rainbow colors and added one of the sentiments with a strip of vellum. Love the sentiments in this set. Perfect examples …. as usual. Really like the grays you have used with the pop of color.